The Houston Astros' 2007 season began with the team trying to take the NL Central title back from the World Series winners, the St. Louis Cardinals, after the Cardinals won it in 2006. They will have to do so without Jeff Bagwell, who retired after the Astros declined option on his contract for 2007, as well as pitchers Andy Pettitte and Roger Clemens, who both filed for free agency on November 6. To make up for losing those key players, they signed pitcher Woody Williams, and traded with the Colorado Rockies for Jason Jennings, and Miguel Asencio. The largest offseason move the Astros made was signing outfielder Carlos Lee to a 6-year contract worth $100 million, the most in franchise history. On June 28, second baseman Craig Biggio achieved his 3,000th career hit. The club club officially retired Bagwell's jersey number 5 on August 26. On January 3, the Astros reported that infielder Mark Loretta would sign a contract worth $2.5 million. On January 12, the Astros signed veteran outfielder Richard Hidalgo to a Minor League Contract. Hidalgo spent his first 8 seasons with the Astros before working with the Mets then the Rangers. He was released on March 24 after a subpar Spring training. By May 2007, the Astros had suffered one of their worst losing streaks since the 1995 season with 10 losses in a row, losing 4-3 to the Cincinnati Reds on May 30. The Astros were just one loss shy of tying their worst skid in franchise history, before snapping that streak the next day, also against the Reds. Longtime Astros second baseman Craig Biggio recorded his 3,000th career hit in the seventh inning against the Colorado Rockies on June 28, becoming the 27th player in MLB history to do so. Jeff Bagwell, who played first base for the Astros alongside Biggio for 15 seasons, was in the dugout and emerged to congratulate him. The Astros fans, who had momentarily quieted after cheering Biggio for his achievement, erupted into cheers again the moment Biggio dragged Bagwell onto the playing field and to the first base line. 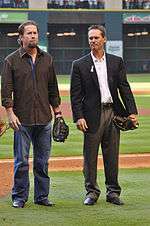 "The thing with Baggy is that he and I worked so hard here for this city and for this organization," Biggio remarked. "We made so many sacrifices as far as playing the game and giving your body to a city, a team." Together, they bowed to the crowd as Bagwell raised Biggio's arm and returned to the dugout. In the bottom of the 11th inning of the same game, Carlos Lee hit a towering walk-off grand slam to win the game for the Astros. On July 24, Biggio announced that he would be retiring at the end of the 2007 season, his 20th season with the club (and a franchise record). 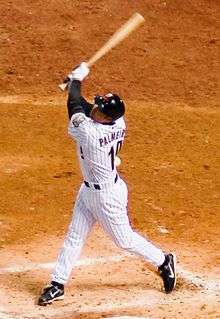 He hit a grand slam in that night's game which broke a 3–3 tie and led to an Astros win. On August 26, the club officially retired Bagwell's jersey number 5 prior to the start of the game against the Pittsburgh Pirates. He was the eighth player in Astros history to have his number retired. Three first bases were used in the game, each embossed with a commemorative insignia that said, "No. 5, Jeff Bagwell jersey retirement, Aug. 26, 2007." One was given to Bagwell and the other two were auctioned to raise funds on behalf of the Astros in Action Foundation. On September 17, in a 6-0 loss to the Brewers the Astros were officially eliminated from the 2007 playoffs. Wikimedia Commons has media related to 2007 Houston Astros season. 1 2 de Jesús Ortíz, José (June 29, 2007). "3000! Biggio reaches career hit milestone". Houston Chronicle. Retrieved February 17, 2016. ↑ Footer, Alyson (April 7, 2007). "Astros to retire Bagwell's No. 5". MLB.com. Archived from the original on April 8, 2008. Retrieved November 27, 2008. ↑ Footer, Alyson (August 26, 2007). "Bagwell's No. 5 lifted to the rafters". MLB.com. Retrieved March 20, 2016.